Jane Lynch Talks "SNL" Experience, Singing On "Glee"
Jane Lynch is still riding high after her successful debut as host of "Saturday Night Live" last weekend, and the actress dished the dirt with Access Hollywood about her favorite "SNL" sketch, her upcoming "Glee" vocals and donating her time for a good cause. "I loved playing the Phyllis Diller-type lady in 'Secret Word,'" Jane told AccessHollywood.com on Friday of her "Saturday Night Live" gig. "I love everything Kristen Wiig does, so to lock eyes with her in that scene and others was a peak experience." Jane also revealed that she will shortly be putting her pipes on display once again on "Glee," this time when a legendary comedienne guest stars as her character's mother. 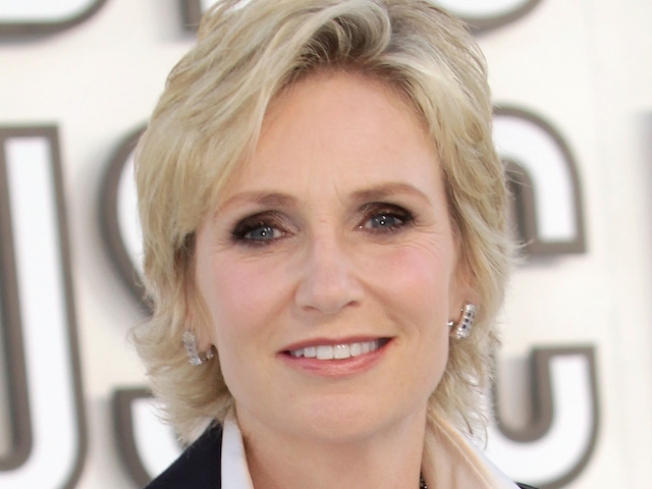 "Sue [Sylvester] will being singing a duet with her mother from a great American musical," Jane said. "[I] won't give you the name of the actress but here's a hint: she was the star of 'The Carol Burnett Show.'" While Jane may play "Glee's" resident bully, the star will generously donate her time to an auction that will raise funds for the American Civil Liberties Union (ACLU) of Southern California – an organization Jane said "is on the side of our basic rights and will fight for them." However, if Jane's hard-nosed cheer coach character had the chance to work with the ACLU, the Emmy Award-winner joked that the "Cheerios" leader would fight for "the right to litter." As for the auction, four lucky "Gleek" auction winners will get the experience of a lifetime as they get to go to Los Angeles to watch a taping of the FOX hit series. The charity package also includes a "Glee" set tour for the winners, and a meet-and-greet with Jane herself. Other cast members may also be on-hand to meet the charity package winner. "The winner will get to see just how much work goes in to making one of our episodes," Jane told AccessHollywood.com. "We usually have anywhere from 4-10 musical numbers, in addition to actual scripted scenes. [The winners] will get to witness the most awesome crew in show business as well as some incredibly talented young people work their bottoms off from morning until late at night. "They may even see one over-50 actress sashay in and out to drop some cleverly written lines," she joked. The auction ends on Tuesday, October 19, at 12 PM PST / 3 PM EDT. For more information on how to win a trip to hang out with Jane on the "Glee" set, click HERE! PLAY IT NOW: Who Will Jane Lynch Dress Up As On Halloween?